Read on for basic answers to common questions about carrying alcohol on a flight. For the official word on what you can and cannot bring with you on a flight (including alcohol), please refer to the TSA. Am I allowed to carry alcohol on a flight? Passengers are allowed to carry alcohol on a flight, both in carry-on and checked baggage, as long as you are of legal drinking age and follow any applicable rules. In general, alcohol must be transported in its original, unopened container. Can I bring any type of alcohol on the plane? If your booze is unopened and 140 proof or less, you can safely bring your alcohol on board. Anything over 140 proof is prohibited, though, according to the Federal Aviation Administration. In addition to alcohol, here are some other things you might not know you can take on an airplane. How much can I carry? How much alcohol you can bring on a flight depends on whether you’re checking your bottles or carrying them on. If you’re packing alcohol in your carry-on, you’ll be subject to the Transportation Security Administration’s 3-1-1 limit for liquids. Containers must be 3.4 ounces or fewer and fit inside one quart-sized bag. If you’re carrying alcohol in your checked bags, your limits depend on alcohol content. 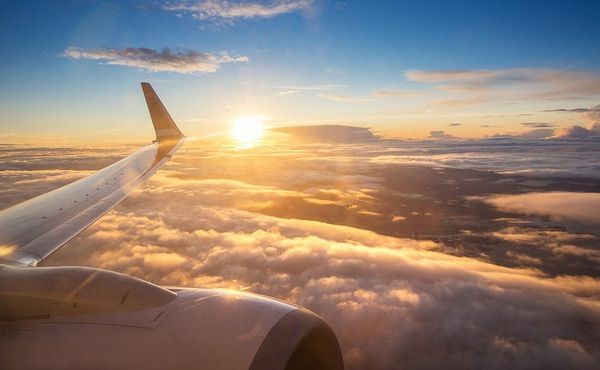 According to the FAA, there are no limits on how much alcohol you can pack in your checked luggage if the alcohol by volume is less than 24 percent (generally beer and wine). Between 24 and 70 percent, however, the FAA limits passengers to 5 liters. However, every country has its own rules on carrying alcohol on a flight. U.S. Customs, for example, only allows for 1 liter of alcohol to be carried into the United States duty-free. If you’re planning on meeting the 5-liter legal limit, you’ll be subject to paying duty and taxes for the other four bottles. Other countries like Kuwait forbid passengers from carrying alcohol in the country entirely. Be sure to check the local laws of your destination before packing alcohol in your suitcase. Can I buy alcohol in a duty-free shop in the airport and bring it on the plane? If you purchase alcohol in a duty-free shop, you can generally take it with you on the plane – but that doesn’t mean it can travel with you the entire way home. If you have a connecting flight and need to pass through a TSA security checkpoint, your bags are once again subject to carry-on restrictions, which means anything over the 3.4 ounce limit needs to go in your checked baggage. This can be especially frustrating to learn during a layover, as you may not have access to your checked bags to check your alcohol (though you will likely have to claim your baggage and re-check it if you’re re-entering the U.S. and then have a connecting domestic flight). To be safe, be sure to purchase your duty-free alcohol at the last airport you visit before arriving in your final destination to avoid losing it at a security checkpoint. Can I drink on the plane? We get it: Sometimes, a stiff drink is the only thing that gets you through a 12-hour redeye sandwiched between the snorer who uses your shoulder as a pillow and the chatty Cathy who won’t stop raving about her trip to Thailand. That may just be why flight attendants serve alcohol – but they are the only ones who can serve alcohol on the plane. It’s against federal regulation to open your own bottle of alcohol on a flight or to drink alcohol that was not directly served to you by a flight attendant. One of the main reasons is that your flight attendants are basically on bartender duty and need to keep your libations to a safe level. If you’re pounding mini bottles every time your flight attendant comes around and chasing them with swigs from your flask, it can get ugly fast. And no one wants to be stuck in a tiny airplane cabin with that passenger (Kristen Wiig’s infamous flight scene in “Bridesmaids,” anyone?). Stick to what the flight attendants serve you and wait to crack into your stash until you get to your destination. How should I pack alcohol? The last thing anyone wants to discover when they open their suitcase is a pile of wine-soaked clothes or glass shards from alcohol that didn’t make it through the flight. 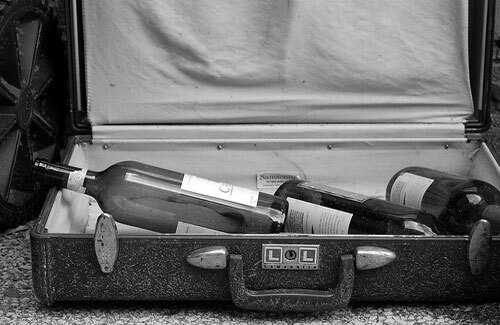 Whether you’re bringing back an expensive bottle of wine, exotic spirits or local beer, proper packing can ensure your alcohol makes it home in one piece. The first step is to start with bottles that have never been opened. Then, place the bottle in a sealable plastic bag. In case the bottle does break, the bag will help contain the alcohol and keep it from spilling on your other belongings. After placing the bottle in a bag, wrap the bottle to give it extra cushioning for the trip. Towels, sweaters, pants and shirts are good options. Not only will they help protect the bottle from bumps and bruises during transportation, but the fabric will also help soak up any alcohol that manages to get past the plastic bag. Finally, try to position the bottle snugly in the center of your suitcase and surround it with more clothes to ensure your bottle survives an accidental fall off the baggage carousel. If you prefer to invest in something to help you carry your alcohol on a flight, products like the padded JetBag can help ensure your alcohol makes it in one piece. If you’re in a bind at the airport, you can also check with your airline to see if they offer packaging. Southwest Airlines, for example, offers wine and alcohol packaging for $5. When you’re only allowed to bring back a limited amount of alcohol, you can’t risk wasting your allotment on sub-par spirits or bottles that you later discover are readily available back home. What you choose to bring back depends on your tastes, but you might want to consider spirits that reflect the local flavor, a true souvenir of your experience. In East Asia, you might opt for the local shochu or soju liquor. In British Columbia or parts of Europe, you might consider a bottle of the local ice wine, while a local varietal from a boutique winery in South Africa or Australia might be the perfect gift for someone back home. And while you’re in Europe? 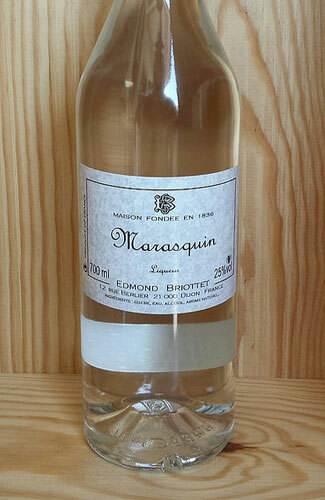 Go for a bottle of Maraschino liqueur right from the source. Curious how your airport and onboard drinking habits compare to other fliers? Check out our survey of Americans’ drinking habits while flying. Marissa Willman earned a bachelor's degree in journalism before downsizing her life into two suitcases for a teaching gig in South Korea. Seoul was her home base for two years of wanderlusting throughout six countries in Asia. In 2011, Marissa swapped teaching for travel writing and now calls Southern California home.